Dunmer distrust and are treated distrustfully by other races. They are often proud, clannish, ruthless, and cruel, from an outsider's point of view, but greatly value loyalty and family. Young female Dunmer have a reputation for promiscuity in some circles. 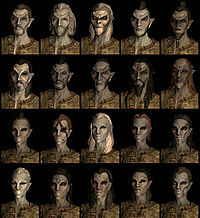 Despite their powerful skills and strengths, the Dunmer's vengeful nature, age-old conflicts, betrayals, and ill-reputation prevent them from gaining more influence. Those born in their homeland of Morrowind before its devastation were known to be considerably less friendly than those who grew up in the Imperial tradition. Also known as "Dunmer" in their homeland of Morrowind, dark elves are noted for their stealth and magic skills. They are naturally resistant to fire and can call upon their Ancestor's Wrath to surround themselves in fire. The effect is equivalent to that of the Flame Cloak spell and benefits from all applicable Destruction perks. Resist FatigueCC (FormID FE00088e: Your Dunmer blood gives you 25% resistance to fatigue. In addition to Flames, Dunmer start with the spell Sparks. The Dunmer's skill bonuses tend to emphasize the use of magic and stealth, making the Dunmer an excellent choice for either an assassin, nightblade, battlemage or spellsword. Their Alteration bonus gives you more of an option of using robes as opposed to light armor which could prove useful if you want to be a pure mage, and the destruction bonus gives a magical offensive advantage at the beginning of the game. Their innate resistance to fire gives them a slight advantage over most dragons, as well as other mages who focus on Fire spells. Their fire resistance can also prove useful for a vampire character seeing as the initial bonuses received by being a vampire enhance sneak and illusion, two skills which the Dunmer are already gifted in. The Ancestor's Wrath ability is useful if your character gets overwhelmed by enemies, as few enemies have a resistance to fire in Skyrim. The main concentrations of Dunmer in Skyrim are in the Gray Quarter in Windhelm, and throughout Riften, working in the local meadery, the fishery, or as merchants. The settlement of Raven RockDB in Solstheim is home almost exclusively to Dunmer after the East Empire Company abandoned it, as is the smaller settlement of Tel Mithryn on the southeastern shore of Solstheim. Dunmer catching thieves in the act may say "What are you doing, s'wit?!" Taking damage "Agh! Filthy n'wah!" "You dare fight a Dunmer?" Sighting enemy (only for male opponents) "Get him!"